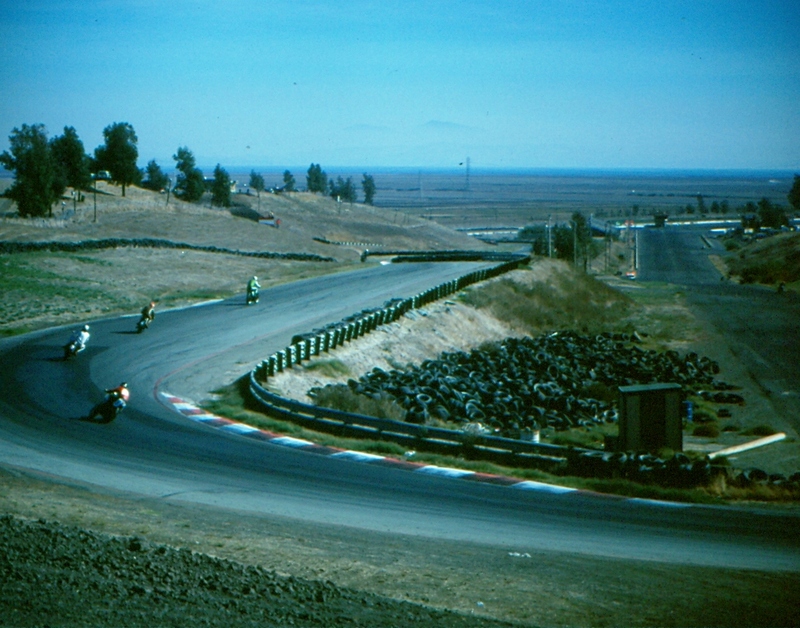 Sears Point Raceway was constructed in 1968 and an AMA National road race was held there in 1969. The lightweight (250cc) race was won by Ron Pierce followed by Yvon DuHamel, both on Yamahas, with Art Bauman third on a Kawasaki. The main event win went to Art Bauman, riding a Suzuki with a motor based on the 500cc twin from the T500 Titan. As I recall it was the first time a two-stroke machine had won the AMA National road race main event. I think Cal Rayborn was second on his Harley Davidson. The race was used as a backdrop for the finale of the movie “Little Fauss and Big Halsy,” starring Robert Redford and Michael J. Pollard. Sears Point closed in May 1970 after recording financial losses and did not reopen until 1973. The original Sears Point track map. When I first started racing at Sears Point raceway, in 1973, it was very primitive. Let’s see…there were two buildings – a scoring tower near the drag strip start line and a snack bar with restrooms in the back of the paddock area. There was also a two story scorer’s shed next to the start finish line, but I don’t count it as a building as it had only three walls. The track was too remote for any town sewers or water, so Sears had its own water and septic system. It didn’t work very well and the water was unfit to drink. It was fine for flushing toilets or washing your bike, but drinking it would make you sick. They fixed that before the start of the 1974 season. There was a set of bleacher seats inside the track, directly between the start/finish line and turn 10. Spectators got a good view of the finish line and of the staging area for drag races. There was no separating wall between the track and the strip, and the faster bikes would drift out onto the drag strip pavement to turn the short S/F straight into a big, sweeping left hand turn. During the three years it was closed there was no maintenance and the pavement was about what you would suspect. It was bumpy, and had lots of small cracks, but no big potholes. I was active at Sears Point until 1980, and aside from the water I don’t recall there being any significant changes to the track during that time. However, in 1975 or ’76 the Bob Bondurant Performance Driving School relocated to Sears Point from the Ontario Speedway in southern California. Bob must have known something because Ontario closed after the 1980 racing season. Some new garages appeared to house the school. The mid-to-late 1980s saw some good things happening. The track was completely repaved in 1985, and the first shop spaces — buildings A, B, C, and D in the main paddock area — were built. More were added during 1987 that brought shop space to more than 700,000 square feet. That same year the track was modified (for motorcycles) after Wes Cooley was seriously injured when he ran wide in turn one and crashed at high speed into the hillside. A low curb was put in along the start/finish area along with an artificial sharp left turn just before the normal turn one. The curb was more like a speed bump, low enough it could be ridden across in an emergency. Bikes exiting the pits were told to stay to the left of the curb while bikes on hot laps had to stay to the right. They had to brake heavily and slow before turning left and heading up the hill to turn 2. It was good for safety but increased the overall lap times. In 1987 NHRA drag racing started using the drag strip, drawing a big crowd. In 1988 Riverside Raceway was torn up to put in a shopping mall and NASCAR moved its West Coast road race to Sears Point. Since Ontario Motor Speedway had closed 7 years earlier for a while Sears Point and Willow Springs were the only racetracks in California. Pedestrian bridges appeared in key areas to allow better spectator movement, and quite a lot of dirt was moved around to give both the racers and the spectators better views. I visited the track in 1997, on the 20th anniversary of my initial AMA Superbike victory. I must admit I had mixed feelings about some of the changes. The new electronic lap-leader tower was cool, and the new front straight was kinda mickey-mouse but I could see its necessity. Even with this modification there were some problems. I didn’t like the bridges. There were several of them and it seemed like no matter where I went they were blocking part of the view. Talking with some of the riders I got the message that in spite of the new pavement it was still a bumpy track and it took hard work to get around quickly. Just like in the old days. A major change came in 1998 when “The Chute” was added, a high speed section that went from turn 4 to turn 7, bypassing turn 5 and the Carousel. The Chute is used by NASCAR and some of the other auto racing events. The motorcycles don’t use the Chute but its construction modified turn 7, turning it from a smooth single apex corner into a squared-off double apex turn. A photo of the original pre-Chute turn seven hairpin, probably taken in 1975 or so. In the far distance on the right is one of the two buildings on the site in 1973, the tower at the base of the dragstrip. This photo shows some of the elevation change of the track. In spite of the change at turn one there were still problems. Turn 10 had very little run-off room and turn 11 had a 4-foot tall, 6-inch thick concrete wall all along its outside. In 2000 the Sonoma County Board of Supervisors approved a request for a multi-million dollar modernization plan that included a repaved track, increased run-off in places, and Hillside Terrace seating for 64,000 people. 2002 was an active year. Infineon Technologies concluded a 10-year naming deal with the circuit in June 2002, giving the finances another small shot in the arm. It was renamed Infineon Raceway (Infineon Technologies makes microelectronics and other items for the semi-conductor industry. They don’t do retail so until the track’s name change you probably never heard of them). That same year an extended pit lane was created and the start/finish straight was realigned, with a wall to separate it from the drag strip, a much needed change. In 2003 the problems with turns 10 and 11 were dealt with. The original track had a steep downhill plunge from turn 8A to turn 9, making turns 9 and 10 one of the fastest parts of the track. They couldn’t increase run-off room at turn 10 because state highway 121 is on the other side of the fence. Instead a new section was added that went from turn 8A, going more gradually downhill with a sharp right-left chicane at the end. This bypassed the steep drop into turn 9, and effectively slowed the bikes as they approached turn 10. For turn 11, a new hairpin was inserted just after turn ten, past the drag strip control tower. The course now bypasses the original Turn 11, which had insufficient run off for motorcycle racing and the majority of car racing (NASCAR continues to utilize the original 8-8A-9-10 corner combination). My next visit to Sears Point was in 2004, for a reunion celebrating the 50th year of the AFM. I recall there being a big new grandstand right at the S/F line but outside the track, near the edge of the paddock area, and a suite of office and conference rooms along the edge of the paddock area facing the hot pit stretch. I visited the track again in April of 2011 for the AMA races, and saw more improvements. The bleacher seats between the start/finish and turn 10 were gone, replaced by the huge grandstand I first saw in 2004. At the top of the grandstand are luxury boxes that are leased to various high-rollers, depending on the event. The hillsides above the Esses, turn 2 and turn 7 have been terraced for better spectator viewing, and RV and tent sites are now atop those hills. The most impressive change was the elimination of most of the bridges, replaced by tunnels. To get from one section to another people walk down a few steps, cross under the track, and walk back up to the surface. Best of all, they’re accessible! Right next to the steps is a lift that a person in a wheelchair, or a parent with a kid in a stroller, can use to get down to the path passing beneath the track. If Laguna Seca would adopt this improvement it would make life there a lot easier for me and many other people. In 2012 the Infineon deal was finished and the track was renamed Sonoma Raceway rather than going back to the original Sears Point. I haven’t been there since 2011, but neither has the AMA motorcycles. I’m hoping MotoAmerica can fix that and we’ll see a return of National Championship motorcycle racing at Sears, er, I mean Sonoma. If it happens I’ll be there.